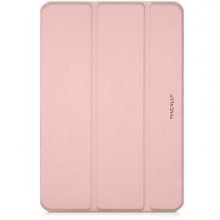 Macally's protective case and stand for iPad Air 2/iPad Pro 9.7-inch in rose gold. The Macally BSTAND5 is a stylish, slim and lightweight folio case that protects your iPad from scratches. The Macally BSTAND5 has openings for easy access to all buttons and controls, stereo speakers, 3.5 mm headphone jack and lightning connector but protects both the screen and back of your iPad.